1.This bedroom is designed for comfort, and oozes style and charm. 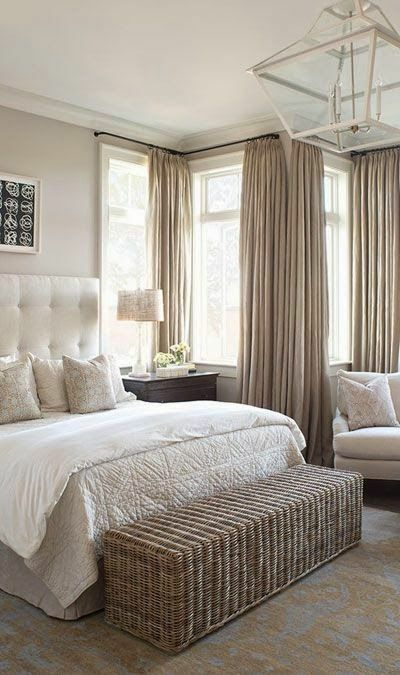 This cozy master bedroom is fashioned with a high wood ceiling and plush linens all done in neutral shades. Eye-catching accents like the fabulous chandelier, bedside lamp, and mirror, all merge to create a stunning sleeping area. 2. 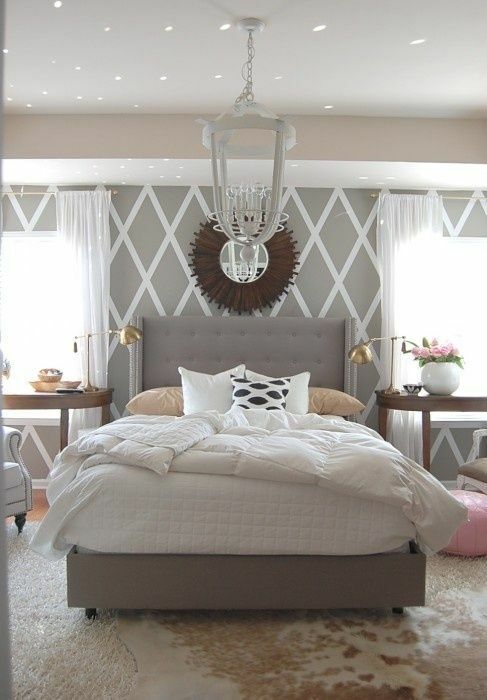 This master bedroom pays homage to the color gray and neutral shades. Dramatic floor to ceiling curtains suspended along a white backdrop create a spectacular affect. The oversized accent rug complements the room’s décor and retains the cozy and placid atmosphere. You can find the rug here and the wall mirrors here. 3. Bedrooms designed in neutral shades have a way of exuding a down-to-earth ambiance. This bedroom embodies all the essentials that make bedchambers relaxing and tantalizing. Decorating accents like the wicker foot-board and accent rug with muted solid hues are catchy. 4. Guest bedrooms take on a life of their own in many homes. Discovering the décor that is best to create a quaint environment all come into play in this cool setting. This guest bedroom entails neutral shades and unaligned furnishings. Most guests would find this bedroom décor easy and impressionable. 5. Take wainscoting embedded on white walls, a neutral tall headboard, and a patterned bed skirt, and you have a bedroom designed for comfort with style. 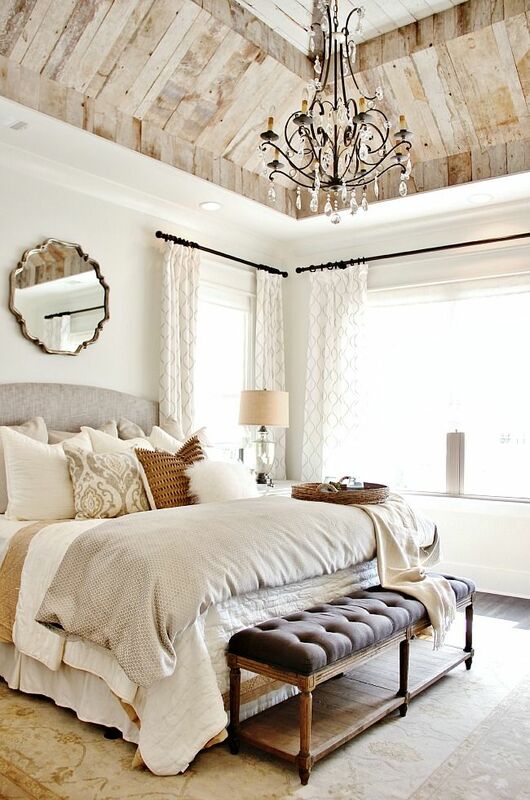 Bare floors give this lovely bedroom a graceful atmosphere. The décor is conventional and distinctive. 6. 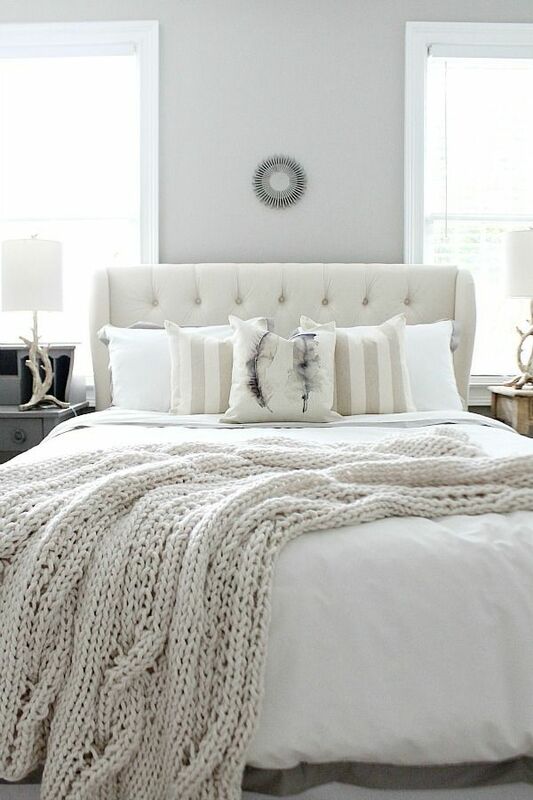 There’s no better way to decorate a bedroom with plenty of natural light than with vivid gray. This bedroom design is the epitome of style. Immersed with soft textures and delicate motifs, this sleeping room incorporates casual dimensions with classic perceptions. 7. The paneling in this bedroom is combined with a plate rail constructed midway up the wall creating a traditional appearance with flair. Plushy textures in gray tones together with stainless steel suspended lighting and dark hardwood floors, is a simple but spectacular look. This bedroom is systematic, yet casual. 8. Visualize a black and white photo, a beautiful bedroom design, and classic décor. Each piece of furniture is meticulously placed. The floor is pristine white wood, the bed is covered with crisp linens. The room is spared grandiose furnishings, except for one stunning chandelier. It’s discreet, cool, serene. This is what you have here. The perfect bedroom designed for distinguished taste. 9. The interior design of this bedroom has a retrograde appeal. The shaggy accent rug is reminiscent of the 60s, the geometrically designed wallpaper is a throwback to the 70s, brass task lamps on the side tables exudes a 80s vibe, and the sophisticated accent pieces incorporate a modernistic appeal. It’s a sensational combination! 10. 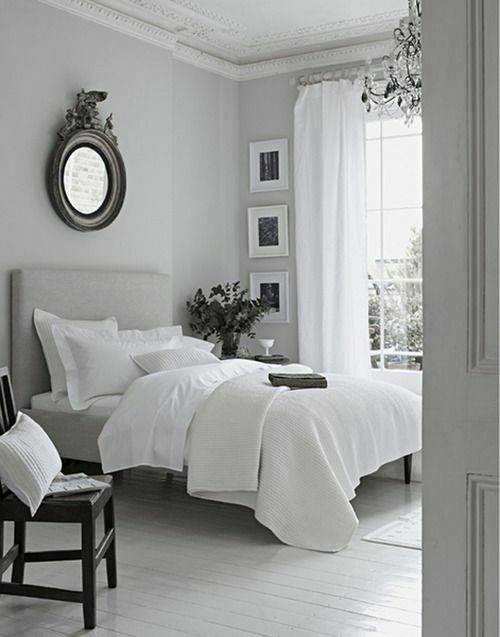 Eggshell white is a dishy shade for bedrooms. Actually, any room does well with this soft tint, especially bedrooms. The color is light, transparent, dandified, and comfortable. With the plush décor, great accent pieces, and overall appeal, this bedroom is a great place to relax and reminisce.